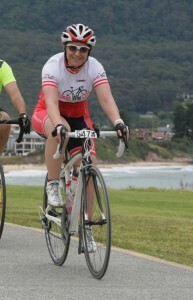 Me on my beloved Specialized Amira. I must confess that this week I’m struggling a bit to write a blog post. I have a great list of potential topics I wrote last week (thanks to an online course I’m currently undertaking) but I’ve just read through it and nothing inspires me. So you’ll have to excuse this week’s rather short and not overly focused offering. One thing I’ve noticed about the many women I speak to about cycling in the bike shop where I work is that many of them feel a bit intimidated by other (particular male) cyclists. They often say ‘oh, I’m not a professional rider’ and I interpret this to mean they are not anything like a MAMIL (Middle Aged Man In Lycra). And it frustrates me that they think that those blokes are all ‘professionals’. Some of them are professionals in their working life – doctors, lawyers, accountants, dentists but they are just regular blokes when they are out riding. They just have enough money and interest in riding to buy all that lovely gear. So this post is a plea to all those women who think they can’t ride a road bike because it is somehow the domain of those lycra-clad men. I don’t let them intimidate me. I dress similarly to them and I use similar equipment, but I don’t obsess over strava segments and I don’t train with a power meter. I just enjoy riding my bike and so many more women could be benefiting from road cycling. That is not to say that road cycling is the only valid form of riding, it just happens to be my passion. There are plenty of other ways to enjoy riding a bike but in my humble opinion road cycling is the pinnacle. Road cycling does not belong to those bunches of ‘fast’ men you see. It belongs to everyone and any woman can get out and enjoy it. I challenge any woman who’s been thinking about buying a bike for fitness or leisure to go to a local bike shop and test ride a road bike. I guarantee you’ll love it. And if you live in Sydney come and see me at Ashfield Cycles and I’ll talk you into it. I am with you Nicola. Lets just get out and enjoy our bikes and the open spaces. For pleasure, fitness or active transport, just be safe and confident. I must admit i did the Lake Macquarie Rotary Loop the Lake last week. I had a blast. It was such fun enjoying a social event with so many others. I enjoyed the company of some lovely MAMILs, they set a pace, cheered me on, waited for me… but i also got a buzz out of passing some of those fat lads on their fancy bikes. Enjoy. Thank you and well said! I purchased my first road bike last fall. It was a gift from my husband for my 60th birthday. I felt a little intimidated walking in to a bike shop (and I had cruised through at least six of our local shops by then) but in this shop, I had a good guy who talked me in to a road bike (I wanted a hybrid), let me test ride three models and I’m so glad I listened to him. A proper fit and I love my bike! I had been riding a 28 year old mountain bike that hurt my knees and back. Now I can’t wait to get out there daily. And yes, I wear lycra! I have just begun working part time in a bike shop (a Specialised Concept Store). I still ask myself, “How does a 53 year old woman get a job in a cycle shop?” Passion for cycling and a love of connecting with people! I have since learnt that some men questioned the hiring of an older woman in a male dominated industry. … mmm … I must admit my hackles rose a little at the thought that these men thought they owned the industry. And so … my response to that is: I aim to work my magic in that shop, and build their already growing female customer base (it’s because it’s growing that I was hired!!!). I may only work Saturdays (I work in a metaphysical shop also, but first and foremost I am a writer–that’s my main job) but I am going to share with the women customers how much fun it is to be out on a bike. I own a commuter/leisure bike and a Ruby Comp, and I adore them both. Cycling feeds the Soul! Hi Nicola, you are soooooo right! It amazes me when I ride – there are some people so geared up to the nines with their fancy bikes and gear – and I overtake them! It’s not about the look – it’s about getting out there and riding for the enjoyment. I must admit I do like Strava – but only as it makes me feel good when A- I beat my time even though I think I’ve had a crap ride and B- Love it when I’m the only female in the top 10 of the day. So ladies get out there and ride – start off small – baby steps and increase the pace and length when you feel like you can. Hi Nicola I really enjoy your columns and information – but hate road riding!! so many cars to look out for, etc. I bought a cyclocross bike last year (apologies, from my lovely local Trek dealer as I have somehow always had awful experiences at Specialized dealers – “oh, you’re X’s partner – you’ll want…”; “how can I help you”to my husband who replied “we’re after some women’s gear” – “what specific items?” to my husband again). The cyclocross has opened up beautiful quiet roads and no worries about stones or punctures or traffic. How about a column on gravel/ cyclo bikes? As light as road bikes& as well designed so you can still comfortably do the longer distances. I am even thinking about the English Three Peaks – but haven’t seen a woman on any of the You tube clips (I know they are there somewhere!). So another topic for your writing.